“I am absolutely thrilled!” Mayor Miro Weinberger could not contain his excitement over the recent decision of Burlington’s newly elected City Council. With five Progressives and two Independents, the council is poised to make significant changes. “These planters and pillars have generated a lot of excitement around town,” said Councilman Adam Roof, Independent representing Ward 8. 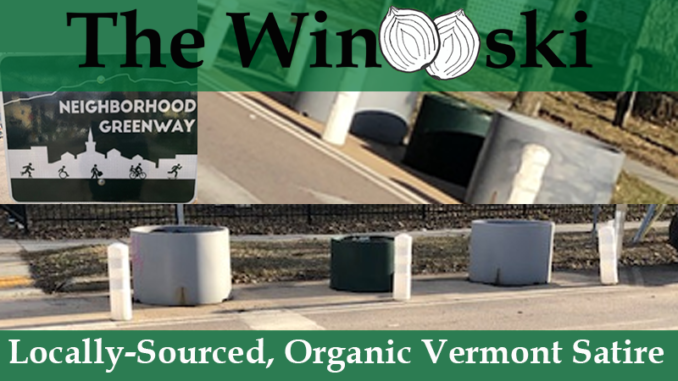 Ward 2 Progressive Councilman Max Tracy chimed in: “I bet four out of five emails, calls or tweets I receive are people wanting to talk about them.” Tracy lives just around the corner from one of the planter/pillar installations. With the anticipated money saved from plowing, the City Council is considering putting the funds toward beginning construction on the Southern Connector. “It’s a win-win situation,” said the mayor.